Flexible Agreements - PRAXIS is the most flexible agent in the industry. Innovative SaaS Escrow Solutions - PRAXIS can keep your SaaS application running even if your vendor fails. Learn more here. Customer Service - Responsive and friendly service that is 100% guaranteed! Automated Software Escrow - PRAXIS was the first software escrow agent to provide automated source code (AKA:”software”) escrow updating services by connecting directly to a software vendors source code archival system. We connect directly to GitHub, BitBucket and most other source code archival systems. Read more here. Why? Historically, most software escrow agreements were only updated 2.3 times per year, on average. The process was manual with software vendors being required to burn DVD’s and ship physical media or bundle IP and submit materials to the escrow agent via FTP service. Either process requires initiative and action on the part of the software vendor. We removed the majority of the friction in making updates to software escrow accounts and dramatically improved the quality of escrow deposits. When a beneficiary must rely upon a software escrow deposit to support their mission critical application they typically need the most updated source code. Quality - Software escrow deposits are updated automatically every week. And we keep all previous versions so our clients are more protected. Efficiency - Software vendors that choose PRAXIS have more time to focus on their business because updating their software escrow is automatic. Assurance - PRAXIS monitors the automated updating service and notifies the software vendor of any syncing issues. Customization - PRAXIS knows that each technology transaction is unique so we encourage our clients to modify our template agreements to meet the specifics of their situation. In additional to providing agreement templates for software escrow, SaaS escrow, source code escrow, trade secret escrow, intellectual property protection escrow and many other types of escrow agreements we can also provide sample language that we have collected over the years to help you further customize your agreement. Upgradable Services - We know that sometimes things change over time. That is why we provide upgradable escrow services packages so that our clients can change, add or remove services at any time. We even provide a pro-rata credit of any unused annual fees towards your new agreement or service. 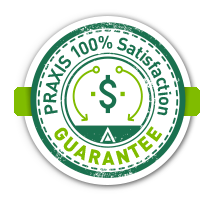 Value - PRAXIS provides competitive, all inclusive pricing so our clients can budget with 100% certainty. In addition, our automated escrow solutions can remove internal engineering costs and dramatically reduce to total cost of escrow protection. If you’re 100% not satisfied with our service during the first 30 days for any reason, please let us know. If we cannot resolve the issue to your satisfaction, we’ll refund your money. No questions asked!